^ This generally accepted chronology for the Western Sahara is provided by the historian George E. Brooks, "Climate and History in West Africa" in Connah, Graham (editor) Transformations in Africa. Essays on Africa's Later Past (London and Washington: Leicester University Press), 1998, pp. 139-159. Fisher, Allan and Humphrey J. Fisher. 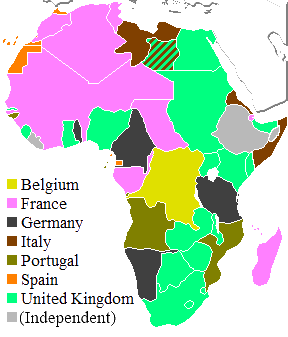 Slavery and Muslim Society in Africa. London: C. Hurst, 1999. Klein, Martin A. Slavery and Colonial Rule in French West Africa. New York: Cambridge University Press, 1998. Cordell, Dennis D. Dar al-Kuti and the Last Years of the Trans-Saharan Slave Trade. Madison: University of Wisconsin Press, 1985. 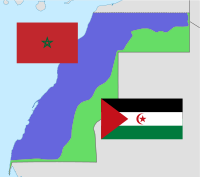 ^ The Polisario Front – Credible Negotiations Partner or After Effect of the Cold War and Obstacle to a Political Solution in Western Sahara? ^ La Gazette du Maroc: La "Répudiation massive" de l'Algérie des colonels ! ^ Mohamed ELYAZGHI au Matin du Sahara: Solution politique au Sahara et refondation de nos relations avec Alger. Diego Aguirre, José Ramón. Historia del Sahara Español. La verdad de una traición, Kaydeda, Madrid, 1987.